Home » Return in Style with a Back to School Tan This Semester! Going back to school means a total wardrobe makeover, a big haul of school supplies, and a brand new you! Get the beach-kissed skin you’ve always wanted or keep yourself aglow with a touch-up, and look your absolute best on the first day back (and beyond)! Let our team of amazing professionals at Bronze Tan, with locations in both Clayton and Brentwood, help you get prepared for the upcoming semester with an array of fully customizable tanning options. The experienced, helpful staff members at each location and consistently judgment-free attitude will keep you coming back throughout the year to refresh your look! We have many different tanning options to get the best back to school tan possible this summer! We offer a variety of well-maintained and clean tanning beds that can give you confident skin you’ll love! Our state-of-the-art beds will give you a stunning, long-lasting tan from every angle while you relax in total comfort. With features like facial tanners that can adjust to suit your specific needs, full-body ventilation (including air conditioning), and turbo-powered bulbs, you’ll feel like a golden goddess after every visit. Both of our St. Louis locations are ready to accommodate your needs, with beds ranging from level 3 to level 5, and a helpful and professional staff to get you on track to your perfect tan goals. 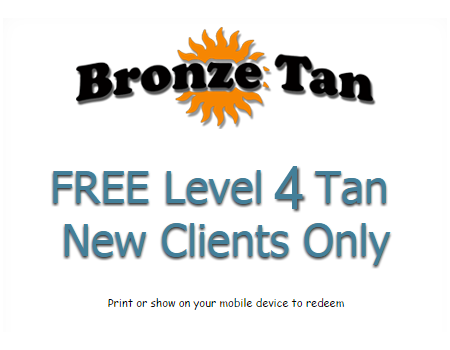 New clients can get a FREE level 4 tan with our mobile coupon! If you’re avoiding UV rays, perfectly bronzed skin is just a session away with our excellent spray tan options! Our Brentwood location offers VersaSpa & VersaSpa Pro sunless spray tan booths, while our Clayton area spot provides Norvell Auto Revolution & Mystic Kyss. Each booth features unique tan options, like moisturizing sprays and amazing scents, and can give you the exact shade and tone you’re looking for! Get the detailed, custom sunless tanning experience you deserve, without compromising your privacy or comfort. 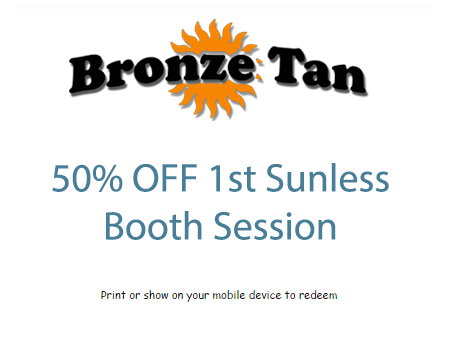 Save 50% on your first sunless tanning session with our mobile coupon! Book your first appointment with Bronze Tan today to get a back to school tan and start the semester off in style!